Chambrer wine coolers offer ideal wine storage for those who are looking for small, compact wine bottle coolers. Apart from wine cooler refrigerators the Canadian company also makes beer dsipensers. 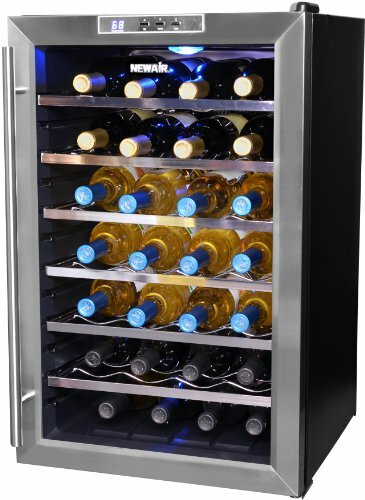 The range of Chambrer wine coolers include two-bottle chiller/warmer, 4-bottle countertop wine fridge, and slim dual temperature zone models with 7-8 bottles storage capacity. Read on to find out the major features and benefits of Chambrer wine coolers and home cellars. low electricity consumption – use less energy than a 100-watt bulb. no hazardous materials (traditional compressor-run fridges contain coolants, organic chemicals which needs to be safely disposed of at the end of the applaince’s life cycle). Compact, space-efficient design – Chambrer wine fridges have small footprint allowing counter or tabletop placement. There are slim freestanding units that fit in narrow spaces. Easy-to-Use temperature settings – factory-set, preprogramed temperature settings for all types of wine (red, rose, white, champagne) marked with easy to recognise symbols. Unfortunately most models have been discontinued. The two dual bottle tabletop chillers are still being manufactured, along with the 8-bottle dual zone wine cooler tower. 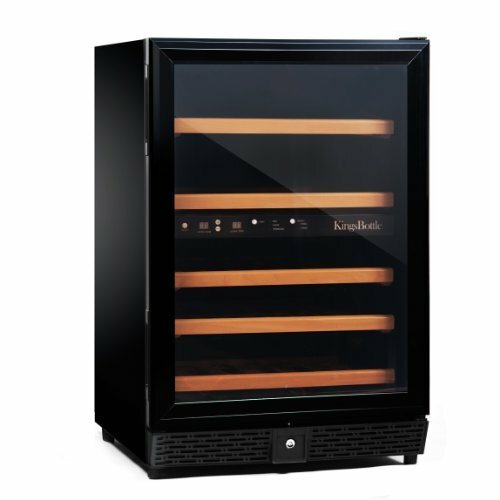 Chambrer wine storage appliances were designed for beginner wine enthusiasts or occasional wine drinkers who need only a small-sized wine cooler for keeping a couple of bottles of their favorite wines cooled to ideal temperature. The Chambrer two-bottle dual zone wine chiller is a very handy device since it can cool two different types of wine to their desired serving temperature. The cooler contains wireless temperature sensors which measure the actual temperature of wine instead of the air temp. surrounding the bottle. The two chambrers of the unit accommodate any size of beverage including canned drinks or champagne bottles. You can easily select and set the ideal cooling temperature with the simple-to-use Perfect Temp System: it includes pre-programmed drinking temperatures for red, white, rose wines and for champagne in the range of 7°C – 20°C (44.6°F – 68°F). The blue LCD display shows both the current temperature of wine and the set temperature. The compact dimensions of the Chambrer 2 bottle wine coolers allow for space-saving placement on table or counter top. Price of the Chambrer 2-bottle wine bar: cc. $110 – $140. TIP: find out more about the benefits of thermoelectric/supercnductor wine coolers. 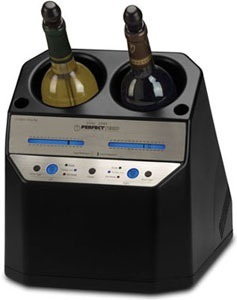 See other 2-bottle wine chillers/warmers. Read review of other 4-bottle wine fridges. Compare Chambrer WC401-137 to Other 4-Bottle Mini Wine Cellars. It comes with 8 pre-set temperatures (from 45°F to 68°F) for various types of wines. You can chosoe and adjust the ideal temperature on the hidden control panel. The readout displays the set temperature in red (either in°F or in°C). The internal convection system ensures proper air circulation inside the cabinet. Two chromed wire racks hold 4 bottles of wine (standard 750 ml). The door is reversible and has tinted glass window. Thermoelectric cooling ensures almost noiseless, vibration-free operation: you can only hear a bit of fan noise when it ventilates the air. The compact footprint allows space-saving placement on top of a table, shelf or kitchen counter. Price: cc. $140 – $180. The Chambrer 8-bottle wine refrigerator holds 6 bottles horizontally on wire shelves and 2 bottles standing up. The benefit of this unit (and the 9 + 3-bottle model) that you can place unfinished bottles in the fridge preserving its quality for 1-2 days. convection air circulation for even temperature distribution. The see-through, slightly tinted door window provides nice view of the bottles. Price of the Chambrer 8-bottle wine cooler: cc. US$ 170 – 190. Price of the Chambrer 12-bottle wine cooler: cc. $180 – $210. These vertical freestanding wine cellars include dual zone models: 6+2 bottle, Model WC6030-197, and 6+1 bottle, Model WC603-137, WC602-137. In this slim double door wine cellar you can store 8 bottles of wine in two temperature zones, 4-4 in each zone: 3 bottles can be placed on wire racks and you can store one bottle standing up. The black cabinet looks attractive with the simulated stainless trimmed glass door. The door glass is slightly darkened to protect wines from UV light. temperature display either in °C or in °F. The temperature range of the upper zone is 45°F – 68°F (7°C – 20°C), and 54°F – 61°F (12°C – 16°C) in the bottom zone. 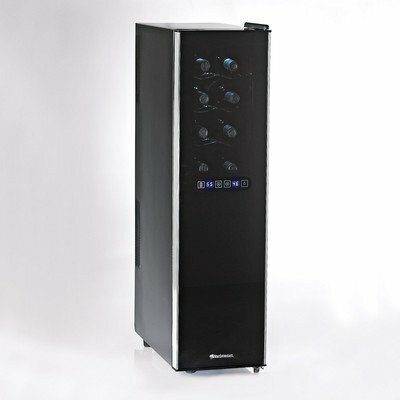 Price of the Chambrer 8-bottle dual zone wine cooler tower: cc.$260 – $280. 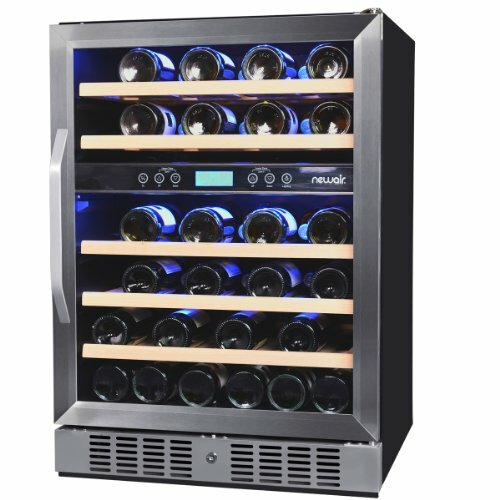 These two-door wine coolers accommodate 6 bottles of wine placed horizontally on wire racks and, 1 bottle in upright position on the cabinet floor: this allows you to put and preserve an unfinished bottle in the cooler. convection system fro proper air circulation. Price of the Chambrer WC602-137/WC603-132/WC602-266 7-bottle wine coolers: cc. $160 – $175. It has the same features as the previous models: thermoelectric cooling method, holds 1 bottle standing up, and 6 bottles placed on racks. The black cabinet has double door with simulated brushed stainless steel finish and tinted glass windows. 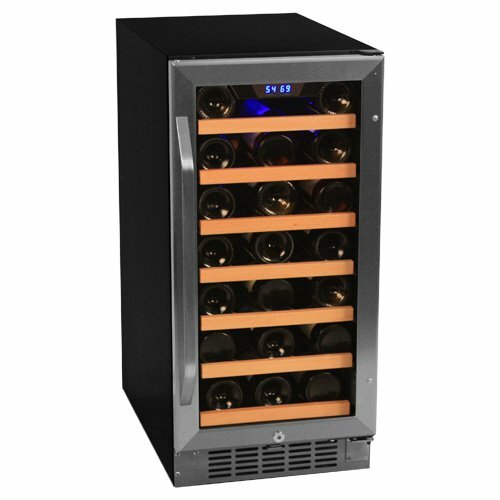 Read a detailed review on the Chambrer WC602-137 Wine Cooler.